While JD (twitter handle @jdbergmanusa) came to Ohio State in Fall, 2003 on a full scholarship to wrestle–a sport which he loved and at which he excelled (having won two state and three high school national titles), he really had visions of parlaying his preferred walk-on status on Jim Tressel’s football team into a becoming a starting linebacker or fullback. There was no secret about this intention: OSU wrestling coach and 1976 Olympic Silver Medalist Russ Hellickson (himself a three sport star at Wisconsin) knew of the plan and embraced it—if JD’s plan worked Russ would at least get his scholarship back and be no worse for the wear—if the plan did not work, Russ would have a wrestler on his squad who could perennially challenge for a national title. At Oak Harbor High (a few miles southeast of Toledo), JD was the guy on the football team: running back, linebacker and punter. In fact, he was first team Ohio Div. III-IV as a running back–future OSU and NFL running back Antonio Pittman, ironically was named to the Div. III-IV second team. In the spring of his senior year, he was invited along with a few dozen players from southern Michigan and northwest Ohio to an all-star high school football banquet attended by at least 1,000 persons. Speaking extemporaneously, guest speaker Ohio State head coach Jim Tressel (twitter handle @JimTressel5), just a few months after leading his Buckeyes to a national title, specifically cited JD for his hard work on the football field and on the wrestling mat. The bond established, one thing led to another and before he knew it, JD had two opportunities at Ohio State, even if the football opportunity did not come with a scholarship attached–yet. What the relationship with Jim Tressel did for certain was that whatever doubt there might have been about his collegiate choice, JD was now going to be a Buckeye. 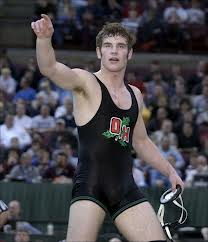 JD did in fact start his freshman year at Ohio State as a wrestler. In fact, he had a stunning freshman year–after losing in overtime in the first round of the NCAA tourney, he won his next seven consolation bracket matches to place third in the nation–as a true freshman! Still, he stuck with his plan to pursue Ohio State football glory in the spring football season following his freshman year of wrestling. 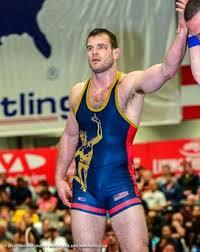 Unfortunately, after the season he participated in the freestyle wrestling US Open and injured a hand. Not being able to participate in football contact drills he hung out with the kickers, hoping to make an impression as a punter. He was befriended by then Buckeye kicker Mike Nugent and seemed to be off to a flying start. Three events standout from JD’s brief Buckeye football career. First, at a scrimmage in Ohio Stadium, supervised by coach Tressel, JD lined up to take a long snap to punt at about his endzone in a full contact practice. The snap sailed over his head. Although he was able to get ahold of the ball before it went out of the endzone, he could not evade the 300 pound defensive linemen in ravenous pursuit and was tackled for a safety. As a walk-on JD was not coddled from facetiously loud veteran player abuse. The second event went much better—at a spring practice in front of invited Ohio high school coaches, JD bombed kicks so deep that coach Tressel told him he would be punting at the upcoming spring game. Dream becoming reality—anyone who knows anything about Ohio State football knows how huge the spring game is. With the name “Bergman” on his back, JD ran out the tunnel for the 2004 edition with the likes of AJ Hawk, Anthony Gonzalez and Pittman. In front of a reported 45,000 screaming fans. When it came time to get on the field, JD was relieved to be kicking from mid-field, not the back of his endzone. Preparing for a high snap, JD was ready. “Hut!” The ball came low, headed for a point on the grass well in front of JD. Prepared as he was for a high snap but being shocked to see a low snap instead, JD stepped forward attempting to scoop at the same time but muffed the snap. In front of 45,000 for his only appearance in a Buckeye football game, his punt was blocked. Now, after a successful Ohio State wrestling career, like long-time teammate Reece Humphrey (twitter handle @reecehump60kg), JD has won two national freestyle titles sandwiched around a year of heartbreak in the 2012 Olympic qualifiers, and is poised to compete for a world title in Budapest, Hungary in September. Buckeyes Humphrey and Bergman comprise two sevenths of the US World team—two others, Keith Gavin and Tervel Dlagnev train with them on the Ohio State campus at the Ohio Regional Training Center (ORTC). There are striking similarities between their Ohio State and national freestyle records (both lost NCAA titles in one point losses in the championship match). (The 2007 NCAA championships were especially eventful for JD. Wrestling in the 197 pound class, JD lost in the first round as a sixth seed. Then, starting from the very beginning of the consolation bracket, JD started an yet another epic run which like is freshman run is still talked about. Along this long and torturous route he had to beat a succession of wrestlers as they themselves dropped down from losses deeper into the championship bracket. 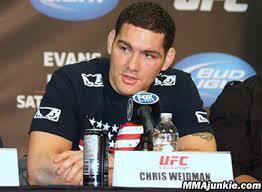 In the consolation semifinals he beat current UFC terror “Phil Mr. Wonderful” Davis from Penn State before settling for fourth place by losing in the consolation finals to the 11th seeded Hofstra wrestler, Chris Weidman (twitter handle @ChrisWeidmanUFC), now a reigning UFC champ after his recent dramatic knockout of Anderson Silva). JD Bergman bursts with energy in conversation, going into extraordinary depth in rapid succession on a host of different topics, but it is clear his life has evolved to one comprised of a unified collection of devotional, relationship, dietary, athletic, training, intellectual, recreational and health pursuits. He describes with charismatic evangelism the interconnectivity of the various facets that comprise his assault on life. So when you ask JD about his diet, he refuses to describe it as such—instead he refocuses the discussion on a lifestyle in which diet is but one essential part. His evangelism certainly includes that with a capital E—his Christian faith is the umbrella within which his life fits—but in toto he is an evangelist with a lower case e—all the many complex and moving parts that make up his life are to be experienced and shared with those who will receive his message, hopefully as a whole, but he is more than happy to break it down and share by component parts. JD’s approach has evolved over time, though recently the approach has incorporated a few drastic revisions. There are several differences between the JD Bergman of last year, who lost his Olympic bid, and the JD Bergman of this year, who has emerged as a more dominant national champion than before. JD has had his share of devastating injuries—a broken back, four knee surgeries, multiple shoulder and disc surgeries. Within the last eighteen months, he has been told that surgery is required, not merely to wrestle, but to ensure he can continue to simply walk. Indeed his wrestling, let alone wrestling at such a high level, at one point represented a clear and present danger to his health. Facing such a prognosis just when he was in a position to strive for athletic achievement on a world stage, JD has addressed it with strict faith/mind/body/care assault in an effort to change his reality. From a training regimen standpoint, JD took three months where he only stepped onto a wrestling mat a few times a week. When not wrestling during that period, he substituted cross training methods, especially borrowing from the increasingly popular crossfit and crossfit mobility regimens (crossfit mobility uses things like foam rolls and pvc pipe to do a sort of deep tissue massage). For his specific challenges, this type of cross training reduces the strain on troubled parts of his body while letting him better dictate how his training can help reduce the risk to and support the injured areas. JD says that although blessed with youth and extraordinary athleticism, his inattention to nutrition was significantly hurting his ability to compete. He now believes, and there are persuasive voices from the scientific community in agreement, that the body was designed to run at a high level primarily using fat as a fuel source, not carbohydrates. Fat is a by-product of eating anything, whether it has nutritional value or not, that is stored until burned. Carbohydrates and their resulting sugar provide little nutritional value but are either turned to fat or burned more quickly in the expenditure of energy. Proponents believe that because of the typical American diet, most people burn sugar first and fat secondarily, thus first relying on a fuel source that introduces little nutritional value. So as a body loads up on bread, rice and pasta that convert to large amounts of sugar, the fuel source is sugar. Proponents believe a diet of mostly fruits, vegetables, fish, grassfed beef, eggs (including the yolk) and nuts, without reliance on dairy, breads and rice converts the body, especially the body of an athlete, into a machine that uses fat as its primary fuel source, which is a more powerful and efficient source of fuel. JD also insists that quality matters in the consumption of food and so he submits that food should be organic where possible and genetically modified food should be avoided. One might think a wrestler, under constant weight loss pressure, would be burning large amounts of fat and if not losing enough to be attempting weight loss results from forskolin or other alternatives, and that’s certainly true on a relative basis. However, wrestlers pay the biggest price for weight reducing inefficiency—those who are the most inefficient wrestle at competitive disadvantage compared to the more efficient weight losing wrestler. So the margin for error is small—unnecessary pounds cannot be left on the table, so to speak. A fat burning program intuitively would seem ideal for the wrestler to the extent it is true such a program burns all available fat before sugar is added to simply fuel a training regimen. And to JD’s mind the food dilemma involves much more. The typical American diet leads to cell inflammation which inhibits cellular waste discharge and restricts cellular nutrient intake–a double whammy. Thus the body feels unnecessary inflammatory pain (not just in muscles and joints where the pain is noticeable, but throughout the body) while starving a little at the cellular level. Again, proponents believe that the bread, rice, pasta and dairy diet leads to and exacerbates numerous health problems including diabetes, arthritis and allergies. As part of his holistic assault, JD also relies heavily and primarily on chiropractors, who he believes as a profession, are focused on and rooted more in prevention of disease. He does not quibble with the extraordinary value of modern medicine in cases of emergencies or severe damage, but so much of modern medicine is focused on addressing problems once they have occurred (after all, hospitals that need to fill beds, doctors who get paid by insurers only when patients have a clear medical need and pharmaceutical companies looking to sell drugs for actual conditions cannot really make money unless someone gets sick–prevention is bad for the provider part of the system generally). Again, these thoughts have support in the health care field at large, though reliable data is still sparse. JD’s experience is that chiropractic practitioners, who are generally cheaper and more available than doctors, have a fundamental focus on and have carved out a niche in disease prevention, and in a sense, guide their patients in more systemic ways to avoid illness and injury. He then believes the specific training they apply using mechanical methods takes stress off the nervous system and other areas of the body, including joints that are so susceptible to injury. The results are apparent to us. The reasons are clear to JD. Spirituality plays a large role: one can readily understand the clarity JD insists he achieves through devotion: whether before a match for concentration on the specifics of the task at hand or as a resort to a source of strength; or in training as a means of breaking down his sport in ways he can understand to better attack his own areas of weakness. One can also understand how thoughtful attention to a code of conduct can simplify choices and remove the tugs of self doubt or uncertainty as one decides how to deal with those choices. But to JD it is more. God has given him a body that is intended to be fed and cared for in a certain way—it is his job, in commanding the machine God has blessed him with, to operate it effectively and efficiently. Thus, in this context, what seem to be setbacks, especially when viewed from the narrow perspective of pursuing an Olympic title, actually become opportunities when viewed in light of the broader goal. So it is that, rather than complain about time lost to injury, JD approaches the time off as a blessing because it affords the opportunity to be involved with youth projects and share on several levels, including spiritually. For much of what you might expect an athlete to do in retirement, you see JD doing now. Public speaking, whether through wrestling camps or as an invited speaker in a variety of settings—church, sport, alumni, promotional, civic—is a cherished opportunity to share his approach to life. If JD were to settle on a specific non-wrestling goal right now he does not jest when he insists it would be to host a food or nutrition show that meets his evangelical approach to eating and living. It is no surprise that JD has found himself in front of a camera—when the eagerly awaited Channing Tatum, Mark Ruffalo and Steve Carell wrestling movie “Foxcatcher” comes out about the time this fall that JD is involved in his world title quest—he can be seen in the movie. He and Humphrey can also be seen with Buckeye Tommy Rowlands (twitter handle @Tommy Rowlands) in the Ithaka Project, a moving documentary on wrestling (see twitter @IthakaFilm2012). But first things first. JD was selected to film a potentially lucrative Nike commercial—an opportunity he had to turn down because the filming coincided with his date in Stillwater, Oklahoma last month for the World Team Trials. Wrestling is, as almost everyone knows, the oldest original Olympic sport, and is in an uphill fight (a fight that seems increasingly winnable) to stave off Olympic ostracization. While wrestling is in fact one of the most popular sports in the world—170 countries wrestle at the Olympic level—it is a sport that perhaps because of its ancient roots and because of where it is most popular (Russia, Iran, Bulgaria, to name a few)—has resisted change. It is ironic that the potential Olympic abolition of the most ancient Olympic sport is in many respects attributable to holding itself hostage to ancient precepts. The move to more actively involve athletes in wrestling’s administration, the scoring rule changes to make the sport more understandable and exciting for the fans, and the expansion to include female wrestling are breathtakingly beautiful changes that were long overdue. JD thus believes that while dropping wrestling from the Olympics would be “ridiculously stupid, the changes that are resulting by the threat are some of the best things that could have happened.” In September, the International Olympic Committee will finally decide wrestling’s fate. In September, JD will chase the dream of becoming world champion. Almost simultaneously, JD and his sport will look to overcome adversity and become all the richer because of it. Another great profile, Garth. JD’s got my support for his support of chiropractors (of whom my uncle counts among their membership) while others would scoff at their contribution to the medical field. These wrestlers are inspirational. They are just as dedicated as a football player on the field or a basketball player in the gym. Good to see them getting their due. Thank you–I am not sure many Ohio State fans know what amazing athletes walk the campus when they are not in the wrestling room. As for JD’s beliefs, all are accepted and gaining mainstream acceptance, But what makes him special is that to do what he does really requires you to run counter to convention, and that takes a lot of planning and effort–which really cause most people to just buy into the system because it is there and does not require much thought. I agree with you–chiropractors and other health pros really can provide more cost-effective and accessible ways to approach health issues. But because the medical industry is not set up that way, you have to do it all yourself and invest a lot of time and energy into it. the same with food choices–the ones JD advocates are not that easy to address, for example in the store or in a restaurant. You can appreciate why he feels such an evangelistic calling–by providing a resource and the knowledge, he could make this healthier choice something that more people could understand and accomplish. I’ve been reading a lot about confirmational bias a lot lately, and running contrary to convention is something I think deserves a second look. Just because something isn’t the norm doesn’t mean it can’t work. Give it a shot! JD is an awesome guy bc he is humble. I hope he never changes that. I have known JD most of his life and he is exactly what you see: honest, humble, faithful, persistent, resilient of mind and body, and impervious to the fears that plague lesser men with confusion and doubt. This is a nice piece of writing and a tribute to a man deserving such high praise and respect. Good work, Garth. 42 yrs involved in this sport and I have never read or been so impressed with a wrestling article. All aspects of a world class wrestler were included. Noting his youth coaches and moving all the way toward diet and faith. Excellent!